At PEDIGREE®, we care about all dogs and their safety and well-being is extremely important to us, and to our mission – to make a Better World for Pets. For that reason, we have announced the extension of a previous voluntary recall of PEDIGREE® Adult Complete Nutrition dry dog food products due to the possible presence of a foreign material. The voluntary recall still affects 22 bags shipped to Dollar General across four U.S. states, but it now is being expanded to 55-pound bags of PEDIGREE® Adult Complete Nutrition dry dog food products sold in Sam's Club in Indiana, Michigan and Ohio. This recall is being expanded to Sam's Club in the U.S. because some of the affected production lot was originally said to be held in inventory but was instead released to consumers, which has necessitated the expansion of the recall. We are confident no other packages or retailers are affected by this recall. We encourage consumers who have purchased affected product to discard the food or return it to the retailer for a full refund or exchange. We have not received any reports of injury or illness associated with the affected product. The lot codes indicated below should not be sold or consumed. 55-pound bags of PEDIGREE® Adult Complete Nutrition dry dog food sold at Sam's Club will have the lot code432E1KKM03 printed on the back of the bag near the UPC and a Best Before date of 8/7/15. See below for a list of Sam's Club stores. 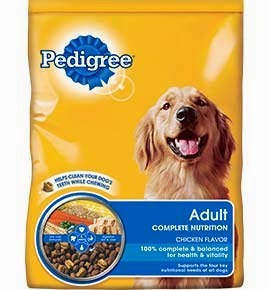 15-pound bags of PEDIGREE® Adult Complete Nutrition dry dog food sold at Dollar General stores will have the lot code432C1KKM03 printed on the back of the bag near the UPC and a Best Before date of 8/5/15. See below for a list of Dollar General stores.